Hamilton, New Zealand: New Zealand fast bowler Trent Boult wreaked havoc with the new ball to bundle out India for 92 in Hamilton as the hosts cruised to a eight-wicket win in the fourth one-day international on Thursday. 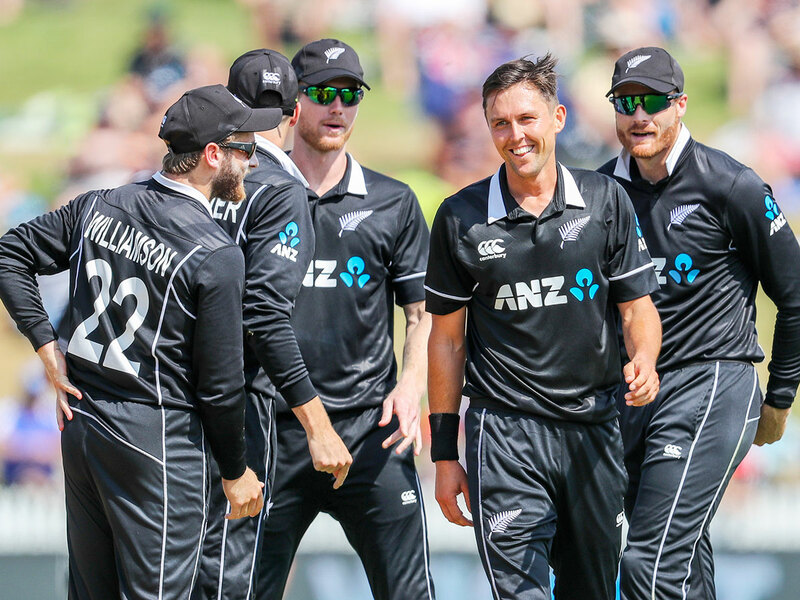 Bowling his 10 overs at a stretch, Boult claimed 5-21 on swing-friendly conditions after captain Kane Williamson won the toss and opted to field at Hamilton's Seddon Park. Having clinched the series with a hat-trick of victories and rested captain Virat Kohli for the remainder of the tour, India looked to test their bench strength in the build-up to this year's World Cup in England and Wales. Shikhar Dhawan and stand-in skipper Rohit Sharma made a steady start and added 21 runs before Boult hit his rhythm. The left-arm bowler first trapped Dhawan (13) leg before he caught Sharma (7), who was playing his 200th one-dayer, on his bowling follow-through. Shubman Gill, whom Kohli considers 10 times as talented as he was at 19, struggled to make an impact on debut and was dismissed for nine runs, giving Boult another return catch. Ambati Rayudu and Dinesh Karthik, competing for a middle order berth in the World Cup squad, were both dismissed for ducks by paceman Colin de Grandhomme, who finished with 3-26. Boult later removed Kedar Jadhav for one and ended India's hopes of getting to three figures by dismissing all-rounder Hardik Pandya (16) in the last over of his spell. Seamer James Neesham and leg-spinner Todd Astle claimed the final two wickets as India were bowled out in 30.5 overs for their lowest score in New Zealand. "One of our worst performance with the bat in a long, long time," Sharma said after India's biggest ODI defeat in terms of balls left as New Zealand romped home with 212 balls to spare. It surpassed their eigh-wicket defeat by Sri Lanka with 209 balls to spare in 2010. "There is something to learn for us, when conditions are not easy what to do as a batting unit. You need to grind it out at time but we failed to do that today. I don't think it was a bad wicket," Sharma said. The Kiwis lost the wickets of Martin Guptill and Williamson early in the chase but Henry Nicholls and in-form Ross Taylor ensured there were no further hiccups. The pair added 54 runs to wrap up the victory which surprised their skipper. "I don't think we expected this much," Williamson said. "It was just one of those days. At the same time, a lot of credit to the guys for the areas they bowled in, especially Trent." The teams move to Wellington for the fifth and final ODI with India 3-1 ahead in the series.